Bella Sera in Williamstown was formerly Cafe Capri. It shares its name with a brand of low price wines so I was interested to see if the food there was a cut above the Bella Sera wines. Six of us converged on this almost local eatery last Friday evening. The place looks nice with an almost elegant decor and the menus matching the signage. I thought that was a nice touch. We had a round table which is always better for conversing and making everyone feel like we are dining together. 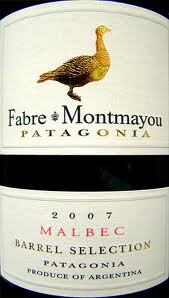 My wine for the evening was the 2007 Fabre Montmayou, Patagonia, Barrel Select, Malbec. I’ve had this one a few times and it’s a very nice wine from the lowest region of Argentina. Priced at $16 it’s an excellent food wine with rich cherry flavors and hints of pepper and spice. Our waitress had a strong Spanish accent which made it difficult to fully understand everything she was saying when it came to announcing the specials for the evening. 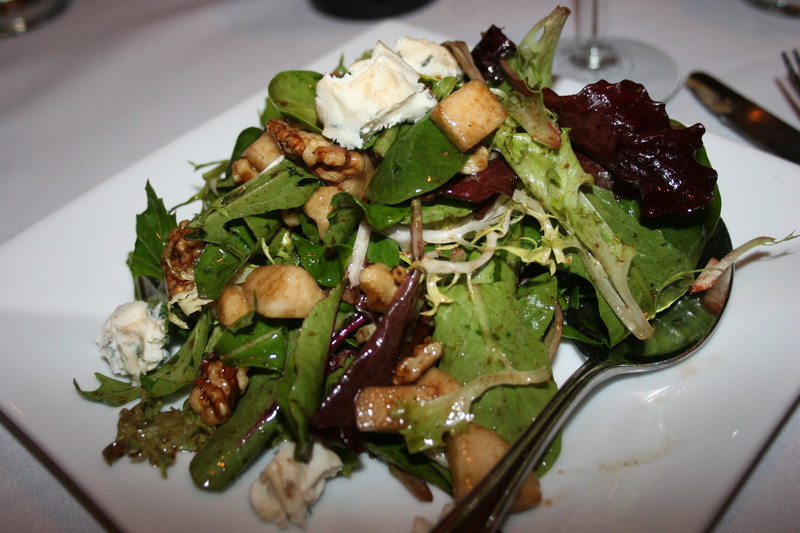 I was able to make out that they had a Gorgonzola Salad with a balsamic dressing and I ended up choosing that. It was pretty good but I was surprised to see that it was $13.00 which seemed way out of line for where we were dining. We all have to take the blame for the items we chose because each time we would inquire of our server as to the price of one of the “specials” she answered with “I don’t know”. It would seem to me since she had all of the specials listed in great detail on her pad which she read from, they could have added the price in case she was asked. Again, none of us forced the issue so we share the blame. 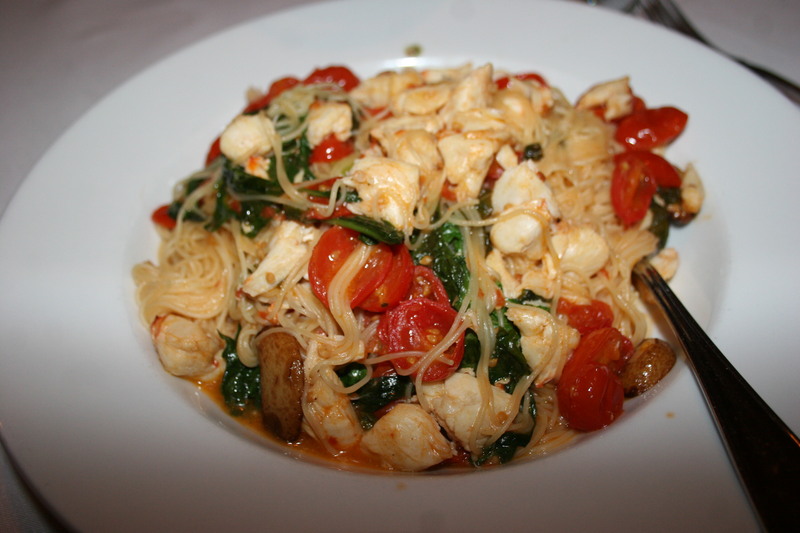 For my entree selection I went with the Cappellini Garda, cappalleni pasta served with jumbo lump crab meat, fresh diced tomatoes and arugula in a garlic white wine sauce. The dish was first-class with lots of crab meat swimming in a tangy cause. 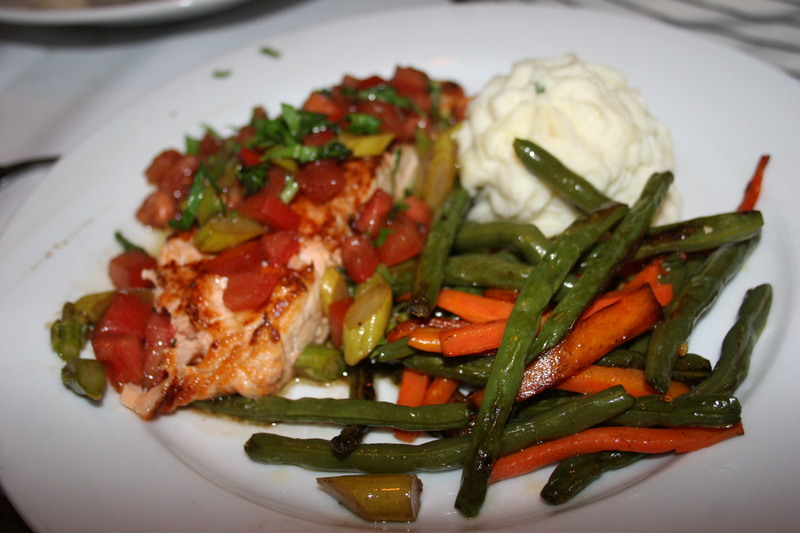 The portion was large enough that I ate plenty and took the remainder home for another dinner. 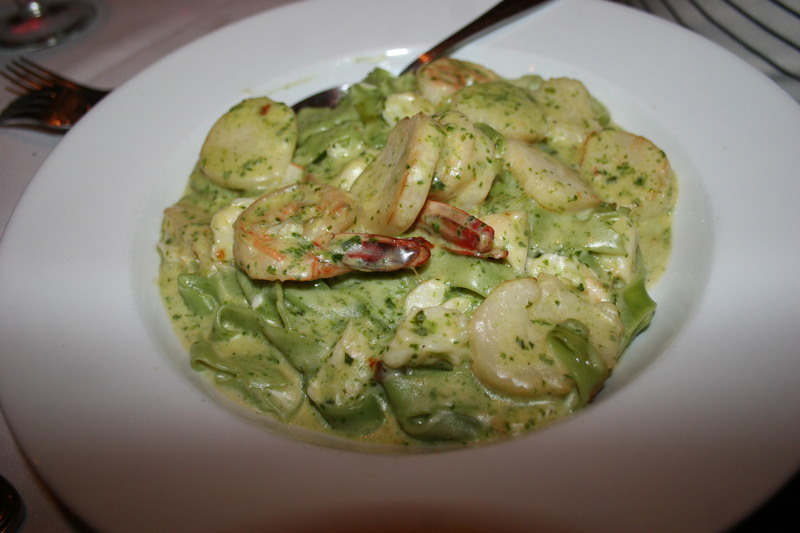 Three in our party of six all chose the Fettucine with Shrimp and Scallops in a Pesto sauce. Lots of rave reviews on this one with my wife insinuating the next night while enjoying what she brought home, that it may have been one of her best meals ever. No faint praise there. 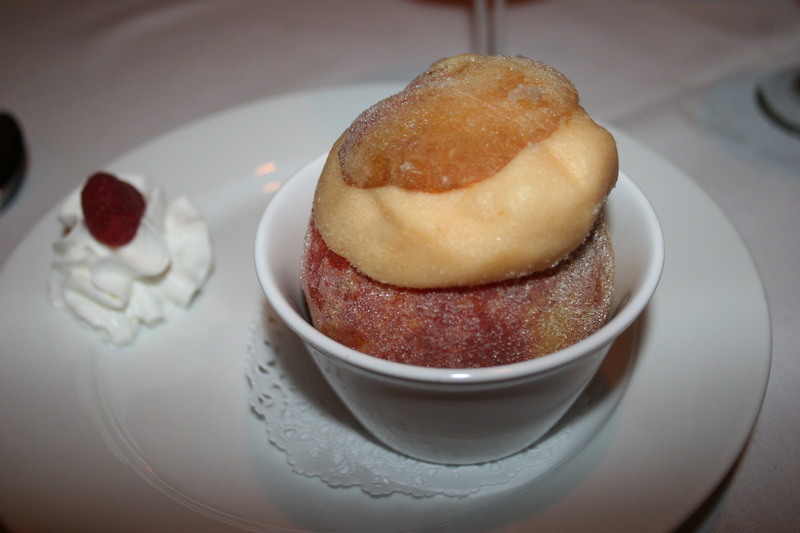 I had a little room left for dessert and went with a simple peach sherbet served in, naturally, a peach. It was simply peachy. 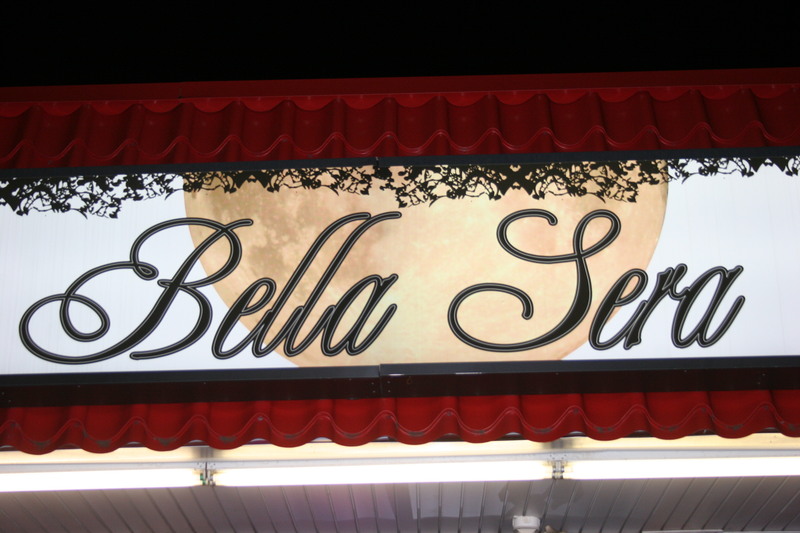 Bella Sera had some hits and a few misses ( a tad pricey at $100 per couple with tax and tip, and Sue’s potatoes) but it’s a nice place that certainly warrants another visit.